People often expect the government to solve problems that they seem unable to solve on their own. Sometimes this is effective and sometimes it is not. Price controls, either price ceilings or price floors, often have unanticipated side effects. Think about it—passing a law doesn’t by itself make economic problems go away! Such is the case with claims of price gouging or the charging of “excessively high” prices, as is sometimes reported in the wake of natural disasters, like the need for water after Hurricane Katrina or the need for gas following Hurricane Harvey. Imposing a price ceiling below the equilibrium price may create as many problems as it solves. The problem originates from the fact that the demand for the good increases suddenly and dramatically. After Katrina, freshwater supplies were compromised and bottled water was hard to access because of the storm damage, so the price of bottled water increased above $5 per gallon. while the supply of bottled water was less as a result of storm damage. The question is how to deal with the shortage, that is, how to allocate the limited supply of bottled water among competing needs and wants. Figure 1 depicts the example of a hypothetical price control for water after Hurricane Katrina. Figure 1. Price control for water after Hurricane Katrina. 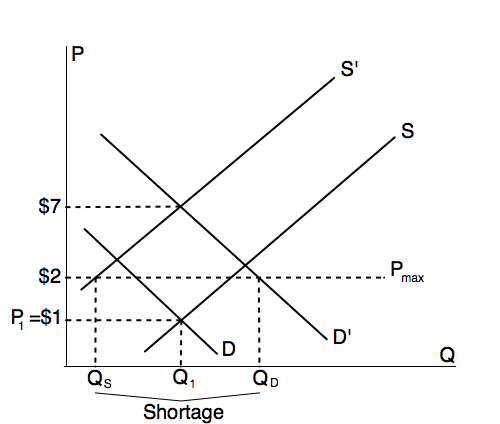 D and S show the original demand and supply curves, with equilibrium at $1. After the hurricane, demand for water shifted to the right at D’. Similarly, the limited supply of water shifted the supply curve to the left at S’. While the new equilibrium price would be $7, the price ceiling of $2 results in a shortage. When a price ceiling reduces the legal price of a product, businesses have less incentive to supply the product. Economically speaking, the law of supply says that at lower prices, the quantity supplied will be lower. At the same time, the law of demand states that at a lower price, the quantity demanded will be higher. This can be seen clearly in the graph. Suppose there is a price ceiling at $2 per gallon of bottled water. The quantity demanded is shown in the figure as Qd. The quantity supplied is shown as Qs. Since Qs < Qd, there is a shortage. So who gets the limited supply? Unfortunately, there is no clear answer to this. It could be first come, first serve. It could be friends of the seller. In many cases, what results are under-the-table payments by consumers willing to violate the law. What is certain is that less bottled water gets to consumers than would be the case if the price were allowed to rise. Many would argue that this shortfall is not the best outcome. Click here to watch a relatively recent example of food shortages in Venezuela.